Charming Lake view house with a separate studio. A plenty of space with lake view at prime location in Seattle. A total of 4 queen beds and 1 queen sofa bed with 3 separate living rooms between main house and studio. with separate living area (1 bd 1 ba with own kitchen and living room) in the Seattle Matthew Beach neighborhood, close to Green Lake, U.W. and major bus lines. Many restaurants, coffee shops, trail and a fabulous park within walking distance. Great kitchen, deck and yard for entertaining. Kitchen, living room, one bath and one bed room in main level. The main level access the large deck with open view of lake Washington. The lower level has 2 bedrooms, 1/2 bath and 2nd living room (Game room). The laundry facility is also in the lower level. Plenty of space for parking - drive way for 2-3 cars. Bus stop is in front of the house. Short walk down the Burke Gilman Bike trail and few block to Matthew Beach. Starbucks verismo system. Guess need to purchase pods. Kitchen fully equip. Studio kitchen also sufficiently equip. We rented house for family event. It was very convenient to everything & had plenty of room for all of us. 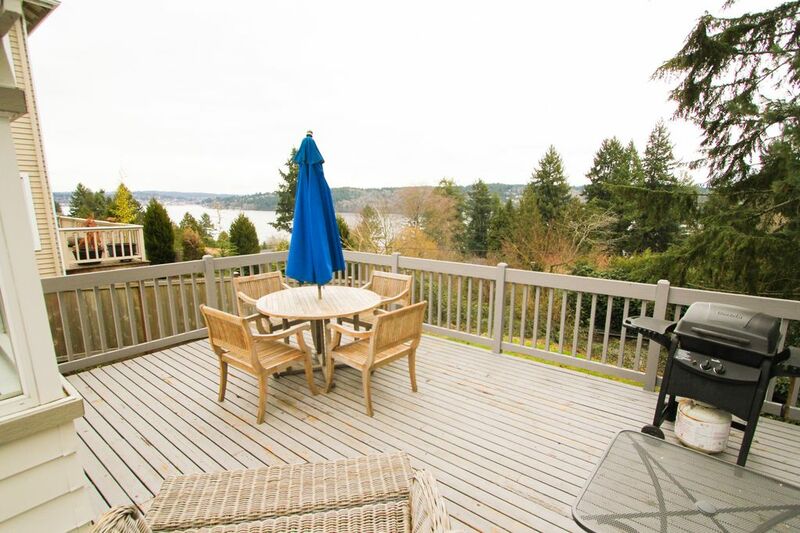 The deck was great & you could see the lake & watch the sea planes come in. Owner was very responsive - we needed more towels & brand new ones were delivered that day. Very nice & courteous. We had the chance to stay here with our family of four and my parents in October. Fantastic setup with three bedrooms in the house and a separate 'mother-in-law' studio outside in a converted garage. Lots of room for all both inside and out. The kids enjoyed playing in the yard while the grown-ups relaxed on the deck and took in the great views. House had everything we needed to be comfortable from well stocked kitchen equipment to internet connected TVs. One thing to keep in mind is that two of the bedrooms are downstairs, so maybe slightly better for older kids comfortable sleeping a level down from mom and dad. Very convenient location to activities downtown, at the University of Washington or in north Seattle. Owner is very responsive and makes the process easy. Great location that is close to so many things! I stayed there with some friends for a football game at the University of Washington. 4 comfy beds with a nice kitchen and plenty of dining space. Suggested improvements would be improved seating for the balcony with more comfortable chairs.